Quick news for you guys. Our package to generate Laravel adminpanel, called QuickAdmin, has been updated to version 2.0. Now it’s capable of generating a Laravel 5.3 adminpanel! 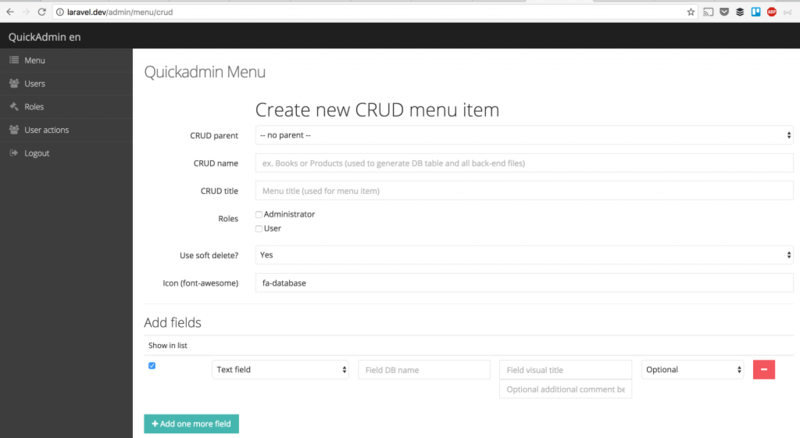 You go to /admin of your project and you can generate menus of your adminpanel visually from then. So, with new version 2.0.0, which is now available on GitHub (or Packagist/Composer), it is generating a Laravel 5.3 adminpanel. It doesn’t work when I create CRUD menu on parent menu. Thanks for reporting, will check and fix asap, hopefully today. Hi Ibenk, could you give more details, what exactly “doesn’t work” and what error are you getting? It works for us, tested just now.